Opened in year 2000, Colmar Tropicale was modelled after 16th century Colmar town, north east of Alsace, France, also incorporating architectural designs and elements from ancient surrounding villages of Riquewihr, Turckheim and Kaysersberg. 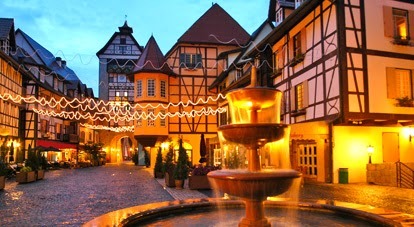 The realization of this French themed village derived from the wish list of the Malaysia's fourth Prime Minister, Tun Dr. Mahathir bin Mohamad, who upon his visit to the region of Alsace were so impressed, that it inspired Tan Sri Vincent Tan, the founder of Berjaya Corporation Berhad to replicate the actual Colmar town in Malaysia. The lifestyle at Colmar Tropicale is highlighted by many attractions whether you arrive singly or with a family. Kick back with a cigar at Le Vin Wine & Cigar Bar and marvel at the lively street entertainment and exciting stage performances from local and foreign artiste. Berjaya Hills is the perfect escapade with genuinely themed attractions set in 150-million-year-old tropical rainforests. IT is a mere 45-minute drive from Kuala Lumpur and is 10km off the East-West Karak Highway where the experience of the journey is effortless and refreshing. The journey for guests travelling from the Kuala Lumpur International Airport (KLIA) to the resort is approximately 1 hour and 45 minutes. This 16,000 acres Berjaya Hills is home to a smorgasbord of world wide themed areas, compirising of Berjaya Hills Golf & Country Club s, Colmar Tropicale - A French-themed Resort, The Chateau Spa Resort and Meranti Park Suites to suit your interests and desires. Located 3,500 feet above sea level, the Japanese Village is the first of its kind outside Japan. The garden was designed by renowned Japanese architect, Kaio Ariizumi and built by a team of 22 skilled craftsmen from Japan. A tranquil and relaxing retreat, this garden is enclosed within a lush tropical rainforest and features attractions such as Japanese Tea House, Tatami Spa, Botanical Garden, Ryo Zan Tei Japanese Restaurant and Ume Tatami Suite. Guest can choose to participate in the Tea Ceremony (4 sessions daily) where one will learn a little more about the Japanese culture or to rent a kimono for a picture or two.